This wonderful project creates a unique panoramic record of the riverside through London over several centuries, showing the built and natural environment in 2014, and the river banks in 1829, 1647, 1616 and 1543. It makes time travel along the Thames possible. The objective of the project is to bring together the past and the present… for the future! 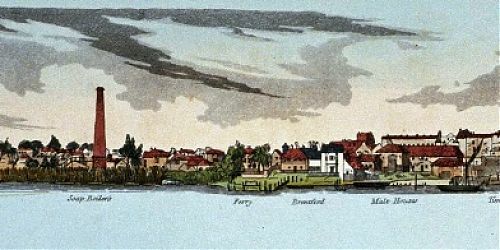 The depiction of the Georgian riverside is based on a 60ft hand coloured aquatint work, ‘Panorama of the Thames’, published in 1829 by London bookseller Samuel Leigh. It depicts 30 miles of riverside between Westminster and Richmond upon Thames. There is information about the waterway, landscape, buildings and people who lived and worked on the banks of the river at the end of the Georgian era. The photographic panoramas cover 52 miles, from the Greater London boundary at Hampton to Tower Bridge in the City, showing the capital’s great river as viewed from midstream. This visual record uses linear panoramic photography, with descriptons for the natural and built riverscape. You will see the architectural variety, the palaces, bridges, islands, parks, and gardens, with information for every interesting feature. The panoramas are intended as a contemporary record, for the future, and are presented here using specially developed software.